This is one of my favourite meals and I have it as an everyday dinner as well as on those special occasions when you are cooking for a few. The first time I made it I was looking to create something that was tasty and filling and both quick and healthy and this was perfect! It’s really easy to make and requires little preparation and everyone who has tried it since has loved it. The sauce produced while cooking is lovely and I think the sprinkle of crushed chillies adds a lovely little bit of bite. The bed of spinach is not in the original recipe (which I adapted from something I saw in my Good Food magazine original recipe here) but I added it as I felt the recipe needed a bit of green and it really goes nicely with it! You can also use any fish that you fancy. 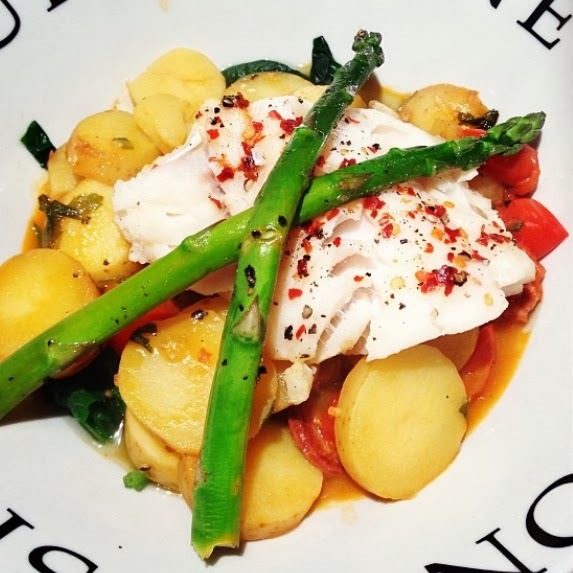 I’ve made it a couple of times now and I’ve used haddock, cod, coley and sea bass fillet. All of them were delicious so go with whatever you can get your hands on! Par boil your new potatoes for around 6 minutes (this will reduce the amount of time they need to be fried) and then drain. Heat a large saucepan and spray with 1KAL. Add your chorizo and cook for two minutes until the oil starts to release and then tip in your potatoes, mix with chorizo and season. Splash over half your glass of white wine and a little veg stock (100ml) , cover pan tightly and cook for 10-15 minutes (or until potatoes are cooked). Add a little more wine/stock if the pan starts to dry out. Make sure you give it a stir every now and then to stop the potatoes sticking to the pan. Then add your cherry tomatoes and parsley (and crushed chillies if you fancy) and stir in. Season your fish well and lay both fillets on top of everything. Splash a little more of your wine and stock over the fish then pop the lid on and leave the fish to steam for about 5 minutes (or until the fish is cooked i.e white and flaky). In another pan wilt your spinach in a little water and then drain and squeeze water out. Place wilted spinach scattered around your plate, your potato mix on top and the fish on top of everything. Finish with a little parsley and a slice of lemon. p.s I also serve this with asparagus griddled with salt, pepper and lemon if I have some in the fridge. If you do this, skip the lemon from on top of the fish! I’ve made this a few times and I really love it! I’m hoping to make it for 4 people later in this week so it won’t all fit in my regular saucepan. Would this work in a large saute pan?